Little did Ohio native, and Boston University graduate, Joelle Sacks know that it would take a trip to The Amazon region of Peru for her to meet the man of her dreams Fernando Suarez Perez. “He was assigned to my father and me as our personal guide for our entire trip while we stayed in an ecolodge in the jungle,” remembers the bride. “Being the professional that he was, I had to make the first move. After nights of ping pong in the rec room and gin rummy on the porch, we knew there was something between us.” After a long distance courtship spending nights video chatting, when Fernando had to keep ordering drinks to keep his table at a WiFi café in the middle of the rain forest, the groom-to-be was accepted to a college in Chicago, Illinois where the bride-to-be was earning her doctorate degree at the University of Illinois. After their global romance finally made its home in one city, the couple sealed the deal with a ring. 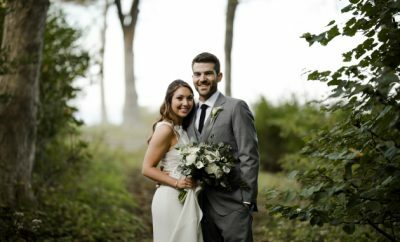 To complement her groom’s custom navy Italian wool suit with black satin lapel while saying their personally written seaside vows, the bride wore a Stella York ivory lace trumpet style dress with a Swarovski crystal and pearl belt. The nautical reception sported a navy and white almond wedding cake with vanilla buttercream, complete with a fondant rope. A navy rope Monkey’s Fist held up each table number. 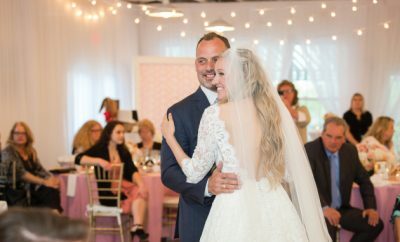 Wedding guests were presented with gift bags filled with local delights, including Newport Style Cookbook, chocolate lighthouses from Newport Sweet Shoppe and a packet of Del’s Lemonade mix. 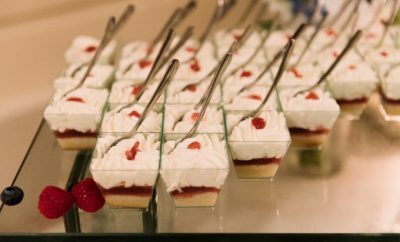 Before enjoying the couple’s first dance, which was a choreographed Argentine tango, guests enjoyed cocktails with tables displaying “real persevered and glazed piranhas from the Amazon River mounted on wooden blocks inscribed with ‘Joelle y Fernando 5.21.17.’” The celebration came to a delicious close with a fireside s’mores feast. To reflect the couple’s elegant “cultural seaside” vows, they chose a color scheme of navy, teal and champagne with a punch of fuchsia. The bridesmaids wore navy chiffon gowns with cap sleeves and carried small round bouquets of white garden roses and peonies. The bride brought a breathtaking punch with a cascade of fuchsia Phalaenopsis orchids. The navy and white reception was the perfect backdrop for more bright arrangements and touches of fuchsia Hydrangeas, Roses, Spray Roses and Phalaenopsis. 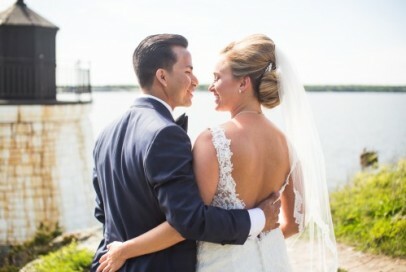 After a honeymoon trip to Thailand, Cambodia and Vietnam in November 2017, the couple will return to their home in Chicago, where Joelle is a doctoral candidate and Fernando attends Roosevelt University and is a restaurant manager.